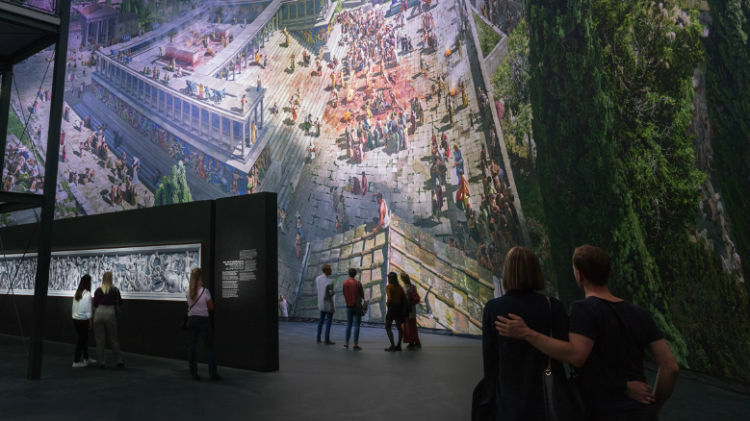 Pergamonmuseum Das Panorama allows visitors a close-up view of sculptures and reliefs from the Pergamon Altar and Yadegar Asisi’s panoramic painting. 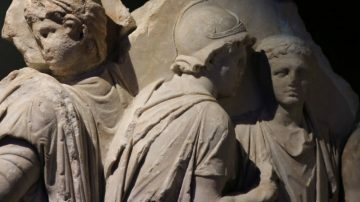 Das Panorama is a special temporary exhibition in Berlin showing some of the sculptures and frieze reliefs of the Pergamon Altar while the Hellenic section of the Pergamon Museum remains closed for renovation. Around 80 statues from antiquity is on display while the Panorama refers to a huge 360° painting by Yadegar Asisi of a day in the life of the Greek metropolis Pergamon. The temporary exhibition will be in place until 2024 – the Pergamon Altar Hall in the main museum should reopen shortly afterwards. The Pergamon Altar from Greek antiquity is among the best-known works in the vast collection of the Berlin State Museums. It was original constructed around 180 and 160 BC in the Greek city Pergamon and was considered by the Romans to be among the highest artistic achievements of ancient Greece. The Great Frieze from the outside of the altar is 2.3 m high and 120 m long and uses around 100 statues to depict an epic battle between the giants and the Olympian gods. The smaller Telephus Frieze was placed on the courtyard walls that surrounded the open-air sacrificial altar platform. 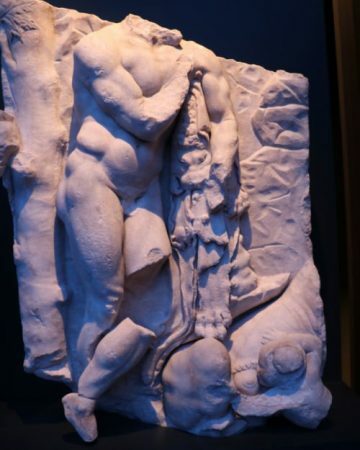 It is 1.58 m high and explains the foundation myth of the city founder Telephos, son of Heracles. Of the original 74 marble slabs, 47 survived. The Pergamonmuseum is currently undergoing a major renovation. 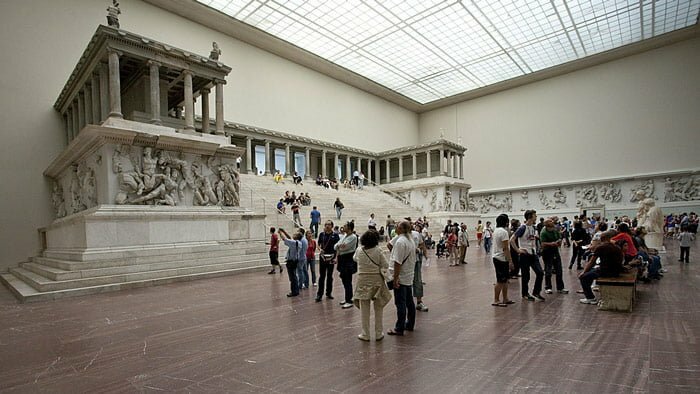 As a result, the Pergamon Altar cannot be seen and will only again be fully accessible to visitors by 2025. At the core of the temporary Pergamonmuseum exhibition is a 3,100 sq m circular representation of the Greco-Roman city Pergamon. 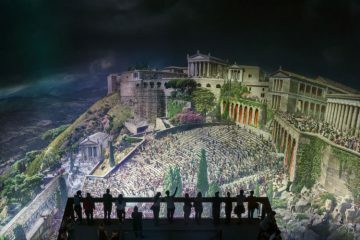 This huge 360° painting by Yadegar Asisi shows the city in AD 129 on the festival of Dionysus when the Pergamon Altar would have played a central role. 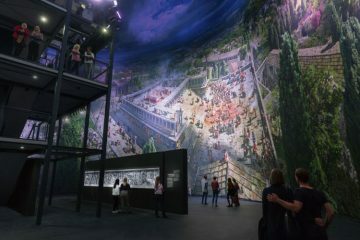 The original painting was enlarged and reproduced on material measuring 30 by 104 m.
A light and sound show allow visitors to see Pergamon through a day cycle. A five-story central tower with platforms allows for a better bird’s eye view of the city. An elevator is available if necessary. The painting succeeds in placing the Pergamon Altar in context with other monumental structures such as the theater, temple of Dionysus, sanctuary of Athena and the Trajaneum. 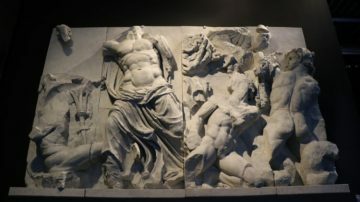 The Pergamon Altar was not a temple – it was a place for the slaughter of animals and offering by burning to the gods on the sacrificial altar. The painting also show the friezes in color, as the originally would have been. Plaster casts show part of the surviving frieze with a large drawing showing what the completed relief probably looked like. 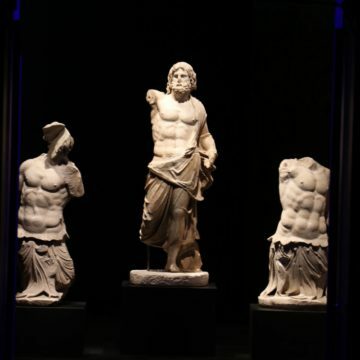 Impressive as the Asisi painting is, the main reason the visit Pergamonmuseum: Das Panorama exhibition is still to see the magnificent Greek sculptures. Around 80 items are on display – mostly arranged according to geographical origin. 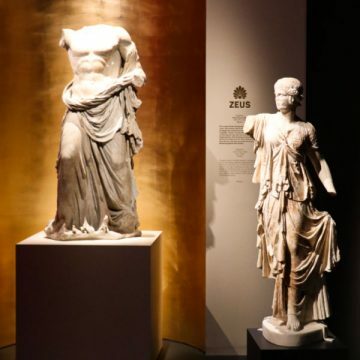 Statues of various rulers, gods and goddesses are on display – mostly with golden backdrops. A few magnificent mosaics show sumptuous Pergamon palace interiors. An impressive group of women statues was placed on the terrace of the Pergamon Altar. Changing lights allow visitors to see these draped statues to best effect in different light conditions. The most-impressive grouping is the 47 surviving marble slabs from the smaller frieze from the Pergamon Altar. 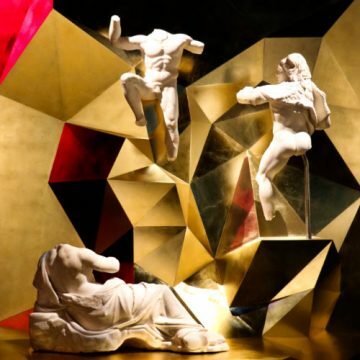 It tells the story of Telephos, son of Heracles, and the foundation of Pergamon to prove the divine ancestry of the kings of Pergamon and thus their legitimate claim to power. The oracle of Delphi, Auge, priestess of Athena, Heracles, Telephus, lions, nymphs, Troy, Achilles – they are all in there somewhere. 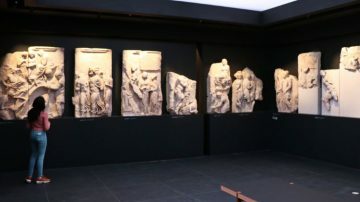 The Great Frieze, a high point of Greek relief art, had to remain inside the museum for conservation purposes but plaster casts and a multimedia show give a good impression what awaits once the museum reopens. The Greek city Pergamon was situated in Asia Minor – in the northwest of present-day Turkey. It was at its peak during the second century BC when amongst others the Pergamon Altar was constructed. The city lost political importance after it was handed over to the Romans in 133 BC but it remained a cultural center with a very important library. The city is mentioned in the Book of Revelations in the Christian bible. The Pergamon Altar was excavated by the Museums of Berlin between 1878 and 1886. The altar itself was already dismantled in the late 7th century AD with some of the relief slabs used to build defensive walls. 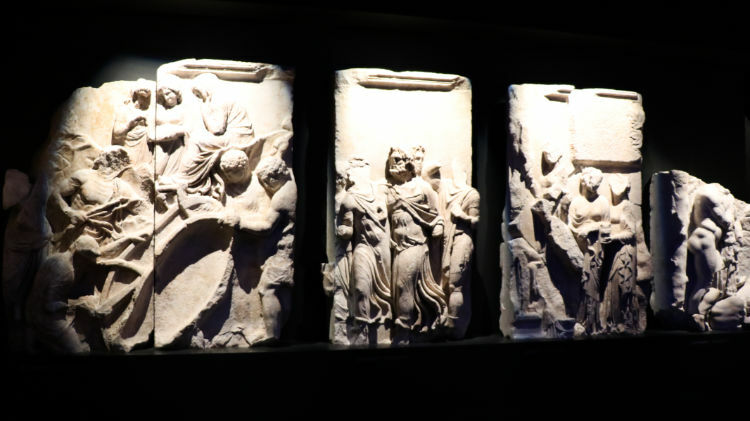 The two friezes were transported to Berlin during the 19th century under agreements on the division of finds – in Turkey most Pergamon finds are in the Istanbul Archaeological and Bergama museums. During the Second World War, the friezes were dismantled and stored in a bunker. Following the war, they detoured through the Soviet Union but returned to Berlin’s Museum Island in 1958. The restored friezes were returned to the Altar Hall in the Hellenic section of the Pergamon Museum in 2004. Due to structural renovations of the museum, the Altar Hall will only again be fully accessible to the public by 2025. Tickets for the temporary Pergamonmuseum Das Panorama exhibition are in addition to normal museum tickets. A combination ticket for the main Pergamon Museum and Das Panorama is €19. Bearers of other museum passes such as the Museum Island Day Ticket and the Museum Pass Berlin need to buy an add-on ticket (Zusatzticket) for €6. Admission is free for children under 18. Time-slot reservations are free online and sensibly should be done for both the Pergamon Museum and Das Panorama. Make free timeslot reservations to skip the line also for children and when bearing a museum pass or similar ticket that may require a further supplementary ticket that may be purchased once inside the building. Visitors without timeslot reservations queue outside in all weathers if the museum is full. 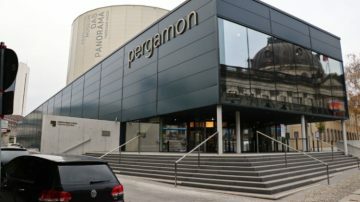 The opening hours of the Panorama exhibition are the same as for the main Pergamon Museum: daily from 10:00 to 18:00, closing at 20:00 on Thursdays. The temporary Pergamonmuseum. Das Panorama exhibition is at Am Kupfergraben 2. This location is near the original Pergamon Museum entrance but off Museum Island to the north of the railway line very close to the entrance of the Bode Museum. The closest public transportation stop is Am Kupfergraben on trams M1 and 12 but many may find it simpler to walk from Friedrichstraße station (U and S-Bahn trains) or from Unter den Linden bus stops Lustgarten (bus 100 or 200) or Staatsoper (bus TXL). Due to ongoing construction in the area, walking paths change but signposting is very clear. To reach the Pergamon Museum from Das Panorama, walk around the Neues Museum and use the small temporary entrance to the left of the Alte Nationalgalerie. (Visitors with timeslot reservations may skip the queue outside and go straight in.) The main entrance to the Pergamon and Neues Museum will eventually be through the modern James Simon building. Ticket Prices for Berlin State Museums (prices for museums, temporary exhibitions, combination tickets, online time-slot reservations). Buying online from Tiqets is a lot simpler and cost the same as the official museum website. Staatliche Museen zu Berlin (official website in German & English).